Lembah Hijau or Green Valley is now becomes one of favorite recreation place in Lampung. Since the opening time in 2006, Lembah Hijau is an all-in-one center spot for education, recreation, and entertainment. Covering 30 hectares are, Lembah Hijau includes a range of facilities, offering a wide variety of activities and entertainment for all ages of people. The park is located on Jalan Radin Imba Kesuma Ratu, Kampung Sukajadi, Bandar Lampung. Lembah hijau, according to its name, is a place that covered within rolling hills, running streams and decorative valleys. Moreover, Lembah Hijau’s vast range of facilities includes a waterpark, football field, outbound activities, mini-train, fishing arena, ATV grounds, paintball and airsoft, a haunted house, 4-D theater, and much more. In addition to the seemingly endless entertainment, Lembah Hijau also provides restaurants and even accommodations for those who want to stay and enjoy the situation longer. This will be enable the visitors to ask all the family member or groups to enjoy the nuance of green valley. For an entrance fee, the visitors can pay for Rp. 10,000, and they can join the fun and enjoy everything that Lembah Hijau has to offer. An additional fee of Rp. 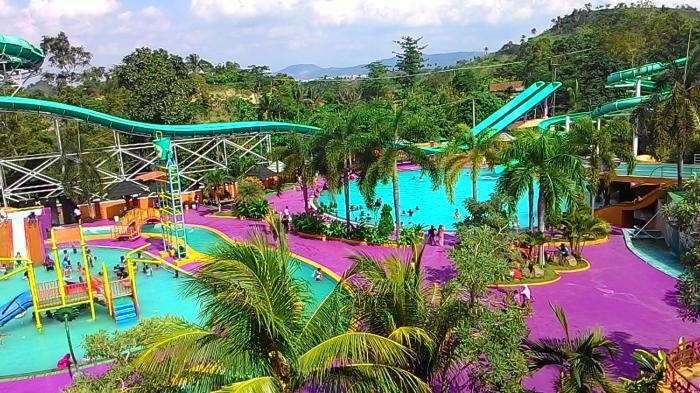 35,000 is required for entrance to Waterboom and the waterpark, which is one of the favorite attractions within Lembah Hijau’s grounds. This amusement park is mostly attracting youngster and children. Between the 30 hectares that comprise the area, there are only 10 area that currently being utilized. Lembah Hijau management is continuing to add new attractions and facilities to ensure that Lembah Hijau remains new, fresh and exciting to pamper the visitors that come. Lembah Hijau is located approximately 30 minutes from Bandar Lampung, the capital city of Lampung province, precisely located in the hills of Sukadanaham District, Tanjungkarang Barat, Bandar Lampung. There is no public transportation to the park, but the access is fairly easy by motorbike, private and rental cars or for larger groups we can chartered the buses. Lembah Hijau is also includes an extensive parking area that will comforting the visitors who come with vehicles.